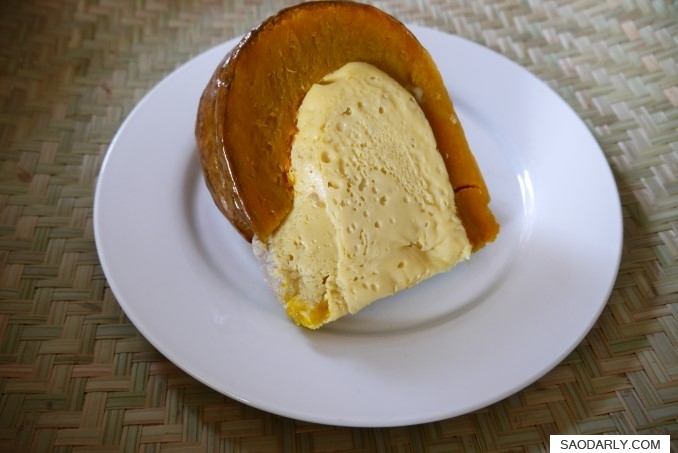 Steamed Pumpkin and Coconut Egg Custard for dessert in Vientiane, Laos. My two aunts were busy to make this dessert from scratch. We went to Vientiane Farmers Organic Market at That Luang esplanade and bought a few pieces of the pumpkin custard. In Lao language, this dessert is known as Sangkhaya Mak Eeu (ສັງຂະຫຍາໝາກອຶ). My mother often made the coconut egg custard as part of the Morning Almsgiving at the local temple during a Boun (Lao Festival). She preferred using duck egg to mix with coconut milk, sugar, and salt over chicken egg. She also made two version of the dessert, one with steamed sticky rice (Sangkhaya Khao Niao) and one with pumpkin (Sangkhaya Mak Eeu).